When it comes to macaroons, I’m a purist. It’s one of those things that I don’t make very often…but when I do, I want it to be the essence of macaroon. Don’t fuss around with it – just give me light, chewy, delicate coconut taste. In the past, when I’ve made them (the last batch being around the holidays), I’ve used the Barefoot Contessa’s recipe. It calls for sweetened condensed milk, which really amps up the indulgence factor. 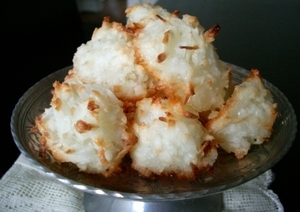 I was excited to try Donna Hay‘s macaroon recipe for Donna Hay #2, graciously hosted by Pearl of the Orient. The recipe couldn’t be simpler, which I loved. The egg whites hold the mixture together and give the cookies a much lighter texture than the macaroons I’ve been making. I added a touch of vanilla extract to the main batter recipe because, well, everything I bake gets an extra "oomph" of vanilla extract. While I really thought the plain ol’ macaroons were great, I decided to dress them up with some toppings. Mounds were always one of my favorite candy bars when I was a kid…and macaroons obviously loan themselves to being mound-a-fied. 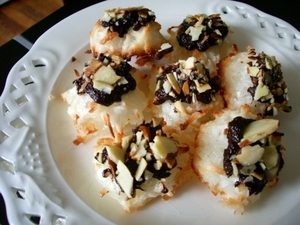 Some melted Lindt bittersweet chocolate and toasted almonds made some killer "Moundaroons". Preheat oven to 180C (that’s 350F for some of you). Place the coconut, sugar, lime zest and egg whites in a bowl and mix to combine. Roll the mixture into balls. Place on a lined baking tray, flatten slightly and bake for 10-12 minutes until lightly golden. Serve with coffee. Makes 15. This recipe looks amazing! I will have to try it. Thank you. ali – i hope so. they were pretty darned yummy. i’m not sure they’re the prettiest but maybe they tasted better than they looked. Scrumptious…and would be perfect with tea. Thanks for particiapting Tami. Your macaroons look so light and delicious. Thanks for stopping by my blog and for the nice comments on the photos. I, too, prefer the “purist” version…but the “moundaroons” certainly take care of the chocolate lovers out there.